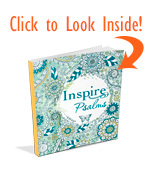 Inspire: Psalms includes all of the cherished features from the original Inspire Bible displayed beautifully in a coloring-book-style edition of the book of Psalms. This charming, square-trimmed, oversized edition of the ancient prayers and praises of Israel contains God's inspired word displayed in a new way to inspire Scripture meditation and response. Inspire: Psalms is a single-column edition of the full book of Psalms combined with key verses displayed beautifully, including words to color in right within the Bible text. There are over 50 Scripture line-art illustrations in the wide margins to color and plenty of extra space for creative journaling. 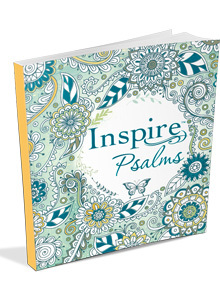 Inspire: Psalms features thicker, uncoated art paper, befitting of popular coloring books, which limits bleed-through and allows for use of even more markers, supplies, and techniques for coloring and creative journaling. Inspire: Psalms is great for people wanting to connect to the Psalms through art and extends a beautiful invitation to slow down and soak in God's Word while coloring or creative-art-journaling on the pages. From Anonymous of Waterford, Virginia on 11/28/2016 .